Note: This is the fourth in a series of posts of Stevie Wonder. 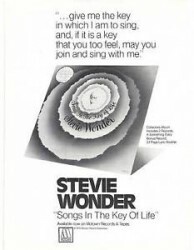 Songs In The Key Of Life is the final album in Stevie’s “Classic Period”1. The album, released as a double LP in 1976, was an instant classic. It debuted at the top spot on the Billboard charts and stayed then for a then-record 14 weeks. Songs is Wonder’s best selling and most acclaimed album, winning four Grammys and selling over 10 million copies. Songs was originally scheduled for a 1975 release; however, Stevie (always the perfectionist) was not fully satisfied with the end result. He delayed the release to the spring of 1976. When spring rolled around, Stevie was still unsatisfied, and delayed the album for another 6 months. The album was worth the wait, as it contained a murderers row of hits (“Sir Duke”, “Knocks Me Off My Feet”, “Isn’t She Lovely”, “I Wish”, “As”). The album also had a plethora of guest artists; Herbie Hancock, Bobbi Humphrey, Minnie Riperton, Denise Williams, George Benson, Michael Sembello, Syreeta Wright and Ronnie Foster were just a few of the greats recruited to participate in Stevie’s masterpiece. Songs stands as one of the greatest records ever made and I strongly encourage everyone to have a copy in their music collection. I’ve included five lesser-known tracks from the album. My hope is that the variety of tracks selected accurately represents the flavor of the album. The first track, “Contusion“, is a jazz-rock instrumental that captures Stevie’s funk sensibilities. The second highlighted track from the first disc is “Summer Soft“. The imagery in the song is amazing; Stevie uses seasons as metaphors to love lost. The end result is a beautifully written mid-tempo ballad that escalates into a deeper frenzy as Stevie’s chord progressions go higher and higher. The first track from the second disc is “Black Man”. This is a personal favorite of mine; it’s not often that you get a history lesson wrapped into good music. Obama needs to use this on the campaign trail. “Ngiculela – Es Una Historia – I Am Singing” is the next highlighted track. The song, sung in Zulu, Spanish, and English, is about why Stevie sings; at its simplest, it’s a song about songs. In fact, I’d submit that this song could easily be about the Songs album. “Another Star” is the final highlighted track from the album. I think of this track as more jazz than pop (as you’d expect with guitar by George Benson and flute by Bobbi Humphrey). It’s another song about a broken heart; however, unlike “Summer Soft” it’s more upbeat. It’s my personal favorite from the album.